There are many cute styles for young girls. The best African American hairstyles for young girls include styles that do not require harsh chemicals or tension on their fragile hair. Choose hairstyles that are simple and easy to maintain, and avoid using extensions in their hair, because extensions tend to add too much weight which will cause breakage. 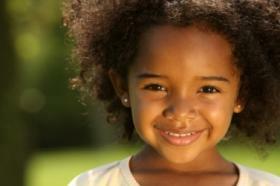 Extensions also tend make young girls seem older than they are, and they should embrace their youth and natural beauty. Traditional ponytails are always in style for young girls. Although it's cute to have multiple ponytails in the hair of small children, pre-teens should have no more than two pigtails and no bows. Younger girls, five and under, look adorable in ponytails and ribbons. Give regular ponytails an updated look by using a zig zag design in the parts. This especially works for two large ponytails, one of each side of the head. It is also easy to use zig zag designs in a three ponytail combination. This style consists of two ponytails, one on each side of the head, near the ears, and a third ponytail in the back of the head. Part the hair down the center for the two ponytails, and then part it from left to right in the rear of the head for the third ponytail. Carefully draw zig zags using a rattail comb. Practice making zigzags on a mannequin so young children won't have to sit long while you experiment. Curls are perfect African American hairstyles for young girls, however, do not allow a small child to slip in hard curlers. Sponge rollers that are covered with satin cloth work fine for special occasions for children who are about 8 and up. Do not curl the entire head. Instead, put the child's hair in ponytails, and curl the ends of the ponytails. Curl the bangs and leave hair out in the back of the child's hair. Use two or three curlers each, in the bangs and the back of the head. To reduce frizz, dampen the child's hair with setting lotion and pull the hair taunt around the curler. Ask the child if the curlers are painful and patiently loosen any that hurt until the child is comfortable. Natural hair looks beautiful on little girls. Always comb the hair while it is wet, using a big tooth comb. Never pull at snags, instead add water, and gently work the comb through the hair. Listen to your child. If she says that the combing is painful, slow down and take a break. Move to another section, and come back to the hurtful area when you feel patient and ready. Add a natural oil, like coconut oil, to ease the comb through. Beauty should not be painful for a child! 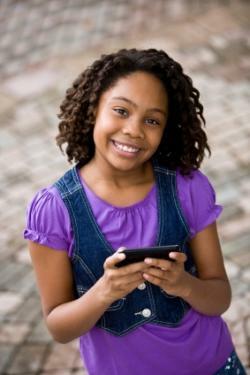 Braids are suitable for children who are six and over, if they have a full head of strong, healthy hair. Cornrows styles are popular because they last about week, and they look neat. If you or someone else is braiding your child's hair, be particularly concerned about the braids' tension. Constantly ask the child if the braids are too tight, and even if the child states that the hair is not too tight, check for areas that appear to be pulling your child's scalp. Sometimes children are afraid to admit that the braids hurt, because they are afraid of upsetting the braider. Braids that are too tight can be painful and result in hair loss. Choose African American hairstyles for young girls that are simple yet gentle, and your child will love to have her hair styled.